I began martial arts training with Judo from the age of 19, continuing for a few years to get to Green Belt and stopping after dislocating a toe! 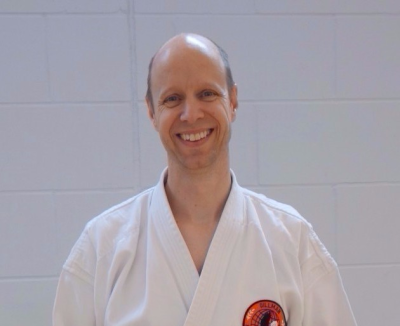 I didn't do martial arts for years afterwards until I happened to see a karate club was training in my local Gym in Maidenhead (subsequently moved location). The club was being run by Senseis Pam & Dave Batten who founded Doushikai Martial Arts. Pam and Dave were fantastic teachers for both young and old and inspired me to aim towards a black belt (1st Dan) which I achieved in April 2013. Personally karate has helped with my balance, flexibility, fitness and general confidence; as well as providing self defence skills in case ever needed. I enjoy teaching others and it is rewarding in particular to see the younger members of the club rapidly develop in confidence and capability. It's also a fun and friendly atmosphere where we all learn together.